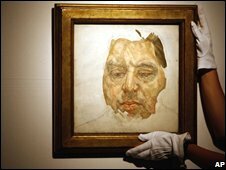 A rare portrait of the artist Francis Bacon, painted by his contemporary Lucien Freud, has been sold at auction at Christie's in London for £5.4m. The unfinished picture, which was expected to fetch between £4m and £7m, sprang from the friendship between two of the 20th Century's greatest talents. Bacon died in 1992, but Freud is still working at the age of 85. The only completed painting of Bacon by Freud was stolen from a gallery in Berlin in 1988 and never recovered. Although the painting fell far short of its upper estimate, art expert Charles Dupplin from specialist insurer Hiscox said the sale was not a disappointment. "It could be viewed as a failure but I can't take that view," he told the BBC. "It is still the fifth most expensive Freud ever sold and, being unfinished, its value is difficult to assess. And it's a very difficult time in the wider world," he added. "It's a very important piece as it shows the interaction between two greats. It demonstrates how they knew each other and their artistic interaction." According to the Reuters news agency, while sitting for the unfinished 1956/7 portrait Bacon left abruptly to pursue his lover Peter Lacy in Tangiers, Morocco. The BBC's Lawrence Pollard said Bacon was already regarded as a master painter before his death and most critics would rank him as one of the most important artists of the late 20th Century. Those same critics would also agree that Freud is the pre-eminent living painter of our age, our correspondent added. Christie's spokesman Matthew Patton said: "We are pleased with the price the painting was sold for, which fell within the estimate." "Freud and Bacon were two giants of the post-war art in Britain and internationally. The painting is wonderful as it gives a fascinating snapshot of their relationship at the time." The two men met shortly after the Second World War and were both figurative painters. The auction was held at a Post War and Contemporary Art Evening Sale on Sunday.